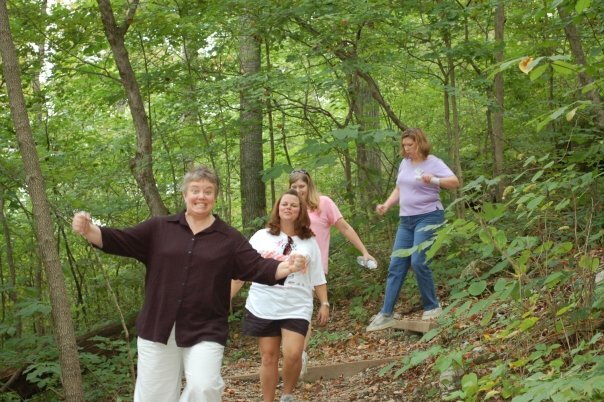 When women who generally live in the city or suburbs gather for things like retreats at state park inns, some of them get the urge to spend time in nature and not just in the lobby or in the pool. Why, however, do we insist on calling our ventures into well-behaved nature a “hike?” And how is it that we spend most of our lives NOT reading maps at all, but then all become expert map readers in places where the landmarks are not street signs and buildings, but trees and rocks and lakes and an occasional foot bridge? A few in the group who nearly accidentally gathered on Saturday afternoon for a hike (on Trail 5) were intent (and capable in every sense of having capacity — including the right shoes and the right legs) of hiking. Most were really out for a walk and were quite content to find a stone or mulch covered path through the woods with occasional logs over which to step and rocks to maneuver. I, for one, was there for a stroll. The essential difference between walking and strolling is not really pace — though it can be somewhat measured by pace. It is intent. We walk with the intent of getting from one place to the other and, if we are want to do so, we can enjoy the sights along the way. Perspective and pace. Those two things make quite a bit of difference, and in more than just the act of wandering through the woods. Would love to have seen you take your rock. 🙂 Thanks for the reminder that it truly is all about perspective.